Offer Terms: Min £10 deposit within 7 days of registration to claim. 300% bonus = 200% bingo bonus (3x wagering valid for 21 days) & 100% casino bonus (50x wagering valid for 30 days). Max bonus available is £150. Opt in needed. 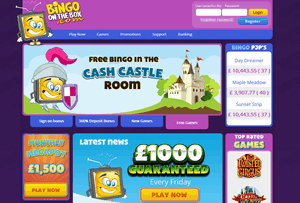 Bingo On The Box is a hugely popular site operating under Betway Limited. The platform was created by a team of bingo professionals who wanted to offer an exceptional site, with exceptional gaming. The brand have been around since July of 2008, but underwent a major overhaul in 2014 providing players with a cleaner, much fresher feel. The site itself runs on the award winning Microgaming software, which brings high definition graphics, and a variety of top class gaming options. A one stop shop for all of your bingo needs including an abundance of slots titles, casino games, chat hosts and goodies galore. The homepage is brimming with colour and personality, with super easy access and info at the ready. All bingo games come in either 75 or 90-ball format, and there is also lots of free bingo and chat room prizes too. Promotions are aplenty including a great welcome bonus, and plenty of great monthly promotions too. Bingo On The Box also really values its players too, offering fantastic loyalty points and brilliant customer service. Host with most “Bob” is always on hand to guide you through your Bingo On The Box experience, offering help and advice with surprise treats along the way. The new player offer is a real draw at Bingo On The Box! Details can be found via the link at the top of this page and terms, conditions and eligibility factors apply. All players must be aged 18 or over. Other bonus features include the brilliant jackpots and loyalty schemes which are available across both bingo and additional gaming. The Treasure Jackpot is a big one. Get yourself down to the Day Dreamer room half hourly from 9am GMT for this huge bounty. At just 20p a ticket, it’s not to be missed. The Multilevel Jackpot has a guaranteed winner everytime. Head on over to the Day Dreamer room or The Sunset Strip everyday from 6:45pm GMT daily, for your chance to win an amazing cash prize. The prize depends on how quickly the house is called and can range between £10 and £5K. The loyalty scheme on offer at Bingo On The Box will reward you just for playing. Whether you play bingo or casino games, you’ll earn loyalty points which are exchanged for casino bonus. The more you wager, the more points you’ll earn. The more points you earn, the more amazing bonuses you’ll receive. Bingo On The Box is a brand registered to Betway Ltd, Malta. The Microgaming network provides Bingo On The Box with a great selection of bingo games. All games are played in either 75 or 90-ball formats, and operate across a variety of fun themed rooms. These include The Friendship room, The Sapphire room, The Sunset Strip and more. Each room has a slightly different style and includes lots of bingo chat gaming too, giving players the chance to win additional bonuses throughout the day. Bingo On The Box also offer lots of free bingo too! Head on over to the Sunshine room every day from 3pm GMT and play along for free. There is actually a larger selection of slots and casino games on offer at Bingo On The Box, than there is bingo. Microgaming offer some of the best slots titles out there and you’ll find all the new releases and top titles here. From classic pub fruit machine to the latest blockbuster titles, get that Vegas feel from the comfort of your own home. Bingo On The Box also have a decent variety of online scratch cards and instant games too including Keno and card games. Casino more your thing? Then fear not as there is also a selection of Blackjack and Poker available too. Whether you are new to instant gaming, or a casino professional, Bingo On The Box guarantee a great variety for all. Please read all terms and wagering requirements upon registration, as info is always subject to change. Bingo wager is 3x bingo bonus, slots wager is 30x slots bonus. Players must wager all deposits through x1 before making a withdrawal. Bingo On The Box offers a fun platform created by bingo lovers, for bingo lovers. The theme is full of character and players can utilise “Bob” throughout. 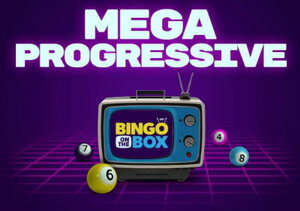 The bingo on offer may be basic but the jackpots and bonuses are excellent, and the progressive community jackpot is also a great feature. A huge draw to the site is its fantastic slots and casino offerings. Find the latest high quality titles with exceptional jackpots and bonuses up for grabs. If you’re looking for a site that has classic bingo with a great range of side games too, then as the tag line says, “Bob’s waiting for you”.